Samsung Pay has updated its mobile app to include an in-app coupon service so users can search, store and redeem coupons as well as a cloud storage feature to restore membership, gift and Samsung Reward cards whenever users sign into a new device. The update is being offered in collaboration with digital promotions platform Quotient Technology. Samsung is also giving away more than $100,000 worth of prizes to celebrate its one year anniversary since launching in the US in September 2015. “At any time, users can upload a membership or loyalty card from select retailers within Quotient’s partner network including many of their favorite grocery, drug, dollar and other retailers,” the company says. 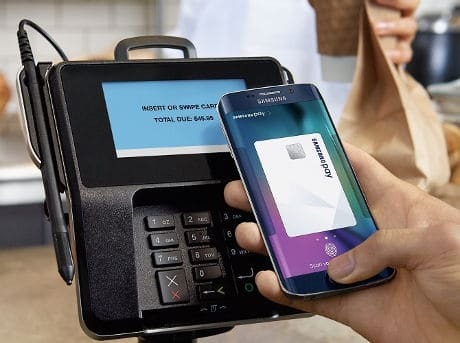 “Users then view hundreds of offers and save the coupons they’d like to use and, because the coupons are linked to a membership account, the savings will automatically be applied when they checkout with Samsung Pay. An update to the Samsung Gear app added access to Samsung Pay for the Gear S2 smartwatch in July 2016. Last month it was announced that some 100m transactions in seven countries have been made using the mobile payment service since it launched in South Korea in August 2015.